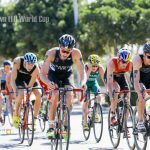 Old College Triathlon – It’s 7am Sunday morning, August 19th 2018, and I’m standing in line waiting for my turn to jump into the water and start my first triathlon race. I’m nervous to say the least, but this has been an ambition for a very long time and I cannot wait to get going. 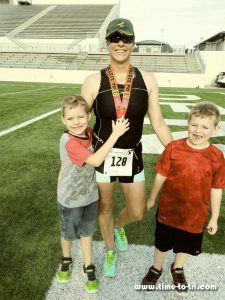 I am taking part in the Old College Triathlon held in Denton, Texas USA. 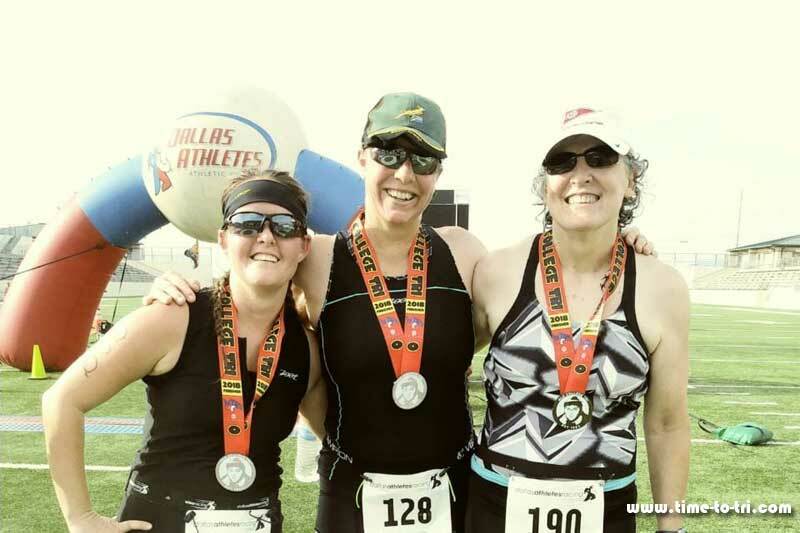 It is a themed sprint triathlon hosted by Dallas Athletes Racing, comprising of a 250m swim, followed by a 12 mile bike ride and then a 3 mile run. 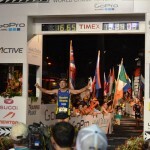 I have a coach – Gavin Doyle and DMG is his operation. I’ve known Gavin since my late teens and now, many years later, he’s my coach. I’ve seen first hand the amazing results he achieved with his athletes from those early years back in South Africa, and though we are miles apart, he took me on and has got me here, to this start line. I’ve had about three months of training with him and am fitter than I have been in many years. He has given me more confidence in my ability to do this race than I gave myself. Gavin errs on the side of caution “not go out too fast” in the run. To walk the first two minutes and to “not mess it up” as going out to fast could blow my whole triathlon. Mentally, that is a tough ask. 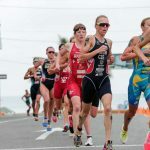 I want to run as fast as I can…swim and cycle as fast as I can and not care at all about pace. But that’s exactly what it is all about. Pace. You have to pace yourself or you will blow and not complete the race. Pace, pace, pace! I said to myself “OK coach. I trust you. A Paced Race it is”. The swim leg is held in a 25 meter indoor pool and the course snakes up and down lanes marked with lane ropes – 10 lengths in all. Should be easy but my heart is pounding and, even though I warmed up when I jump in, I cannot catch my breath. Gavin’s words float into my head “If you get tired, or panic, glide. That’s why I made you do all those lengths gliding. Just glide till you get your breath back.” He knew I would get nervous, knew that my breathing would be all out of sync, knew that I needed to be able to glide, even if only for a few strokes. Glide till you get settled. It is sheer madness and adrenalin takes hold for the first two lengths, then quiet. I get my stroke going.. breathing every 2nd stroke. by the swimmer in front of me. I look up to see no way past him as there are a couple of competitors in front of him, one trying very unsuccessfully to pass the other and creating a bottleneck as a result. I did not intend to do breast stroke or wait at the wall during the swim! And yet… I’m doing it! I am caught behind this congestion and my concentration turns to anger as obviously somebody has posted a faster time than they are capable of swimming and, as a result, was misplaced in the queue. Said person then refuses to wait on the turn to let the faster swimmers through and my fast swim time that should have been is no longer! All those afternoons of swim training… all the hard work, repeats, short rests between sets and water in my ears to gain precious seconds. G O N E! I’m not the happiest person I have ever been as I climb out of the pool and stripping off my cap and goggles, run for my bike. Still, the race is on and I’m going to do the best I can. The venue is lovely. Denton Natatorium Aquatice Center is in Denton, Texas, USA and the pool is more than adequate to host the swim leg. Once out the pool, you exit via doors opening out a pedestrian area that leads out of the complex and to the parking lot where our bicycles are hooked up by their saddles onto the racks erected especially for today’s event. My cylcing and running gear is all laid out ready and waiting for me. I quickly get my cycling shoes on, shove on my helmet and do up the chin strap. The marshalls won’t let you on your bike without the chin strap done up. In my haste, grabbing my bike and rushing to the end of the bike rack, I forget my sunglasses! Back I go. There is nothing worse than the experience of a bug zinging into your eye at a million miles an hour while on the bike. Except, perhaps, if it happened while trying to race! Finally, out of the transition area and on my bike, I can get moving again. The bike course takes the main road and leads north, away from the complex. The outward-bound route is fast. A couple of hills, but nothing challenging. I cycle past horse and cattle ranches and the countryside is really beautiful. The route is well marked and policed and I felt extremely safe as I put my head down and try to concentrate on maintaining my spin and achieving a decent time for this leg of the race. Its a fairly straight route there and back with a policeman and his patrol vehicle, lights flashing stationed at the turn-around point. Another patrol vehicle drives up and down the route to further ensure the safety of the athletes taking part. Traffic is held back while cyclists make the turn and start their journey back to the transition area. I sneak a peak at the Super Athletes already on their way back as I keep my spin going to the turnaround sign. They are immensley impressive and I wished I could be that good. The route back is along the same road but with a slight uphill gradient most of the way. The steepest hill awaits at the end of the route. I was surprised to find the cycle back not as arduous as I had originally thought it would be when we drove it the week-end before in the truck. I kept on looking at the trees to see if they were moving with me and I had a tail breeze but nothing. Once up that hill it’s not long before you are back in the transition area. The run. Oh boy! The run bit! Firstly, I forgot to drink on the bike. So stupid of me! After dismounting my bike way before the ‘green line’ and scooting across to my spot in the transition area with it, I quickly got ready for my run. “Don’t forget to take off your helmet. Don’t forget to take off your helmet!” Took off my helmet and put on my cap. Wasted time drinking. Note to self ‘Drink on the bike next time!’ That was so unnecessary. Then out the transition area I go. Little voices yelling at me from the grassy verge, “Walk mommy! Gavin said you had to walk! Don’t run yet!” His spies are everywhere!!! I look down at my watch… another minute and a half to go. Finally I can run. Well more of a very slow jog actually for the first few minutes. “Keep your hands at your sides” Gavin’s words are in my head again and knowing he has his little spies out there, I comply. The running course circles the CH Collins Athletics Complex stadium then takes a left turn down Long Road to the water station at the turnaround point. The water station is manned by some of the happiest volunteers I have ever met. Smiling as they make sure all the cups have water for everybody. I pass a friend on the way back up the run route just as she is on her way to the water station. We shout encouragement at each other and I make my way back up to the stadium to start my second lap. My husband and sons are waiting for me at the top end of the stadium and are jumping up and down and shouting further encouragement (husband didn’t jump up and down – we need to address this for the next triathlon). I’m getting tired and would have loved to walk, but didn’t want to in front of them, and so I kept on going. Pace was still good so I think it was more mentally challenging than physically. Back I go onto the second and final circuit of the run. I ‘m thinking about walking again as I pass my friend for the second time. “No walking!” she yells. Oh well, there goes that idea. Finally I run into the stadium, and take on the 40 yard dash towards a huge air-filled arch with the ‘Dallas Athletes Racing’ logo on it and the finish line. I hear my name announced over the loudspeakers and that it was my first triathlon. I cross that line and get promptly mugged by my husband and kids. They couldn’t have been prouder. And I…. well, I felt a little bit of everything I guess. The finishers’ medal was hung around my neck, I grabbed a bottle of ice cold water from one of the many metal tubs there and made my way over to a computer screen with a fair number of athletes gathered round looking at their race results. Results flashed up on the screen as athletes came in and showed their splits and overall final position. I achieved. A wonderful sense of accomplishment washed over me as my family hugged me at the finish line. I wasn’t fast and I didn’t place in my age group, BUT I was there. I did it! It didn’t matter to me that I hadn’t won as much as I was always convinced in my head that it would. It doesn’t mean that I’m not competitive and that I don’t care whether I ever do win or place in my age group. I absolutely crave all that, but the taking part and being a role model for my family is of massive importance too. Its so true what is said about the taking part. Before I entered this race, in my head, I was far better than I actually am. I had myself on the podium. Yeah right! In reality, I’m middle of the pack – a fifty percenter. But, I have made a mark in the sand and will go on from there. What was far more valuable to me, far more valuable than receiving a trophy or medal, was seeing my sons and husband Greg waiting for me as I got out the pool, at the transitions, on the run route and at the finish line. My little ones had their hands outstretched for me to touch them as I ran past on the run route. Hearing them yell “Go mommy! Don’t stop!” and seeing the excitement on their faces. The medal I received for taking part is theirs… All I did was do the race. What they gave means far more than that. The devotion and support from my husband and my sons shows me how loved I am and how much I mean to them. Not to mention my coach. Thank-you Gavin. Thank-you for your support in more than just the great training programme you gave me. For being on the end of the phone listening and encouraging while I yabber away about the fantastic times I wanted to achieve yesterday. For your endless patience and not losing your will to live with the endless mental stress I deliver. Hungry little boys demanded pancakes and watermelon so after photos with family and my two friends who also raced, we went over to the pancake, watermelon station and got them fed. I am so impressed with the way this triathlon was hosted. The race organisation was fantastic. 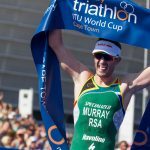 From start to finish, I was never in any doubt as to where I needed to go to get my number, timing chip and which line to stand in to get my numbers written on my arms and legs, where to station my bike and why.. The volunteers were polite, friendly and extremely efficient. It took a lot of stress away. At the start of the swim, the basic rules were explained and first-timers were asked to identify themselves and congratulated for taking part in their first triathlon. I can speak for myself and two friends, who also raced with me, when I say that we had an immense amount of fun doing this race. One was also a first-timer and the other hadn’t raced in over seventeen years. We will all be back again next year! A most enjoyable morning was topped off by a relaxing afternoon spent at the Denton waterpark (right there next to the pool I had raced in earlier) with my family, floating down the Lazy River on a giant round floaty! 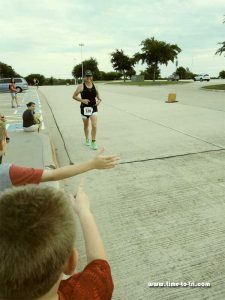 Thank-you to my family for being my biggest supporters, Gavin Doyle and DMG for being an awesome coach and giving me a fantastic training programme and to Dallas Athletes Racing for hosting one challenging yet extremely fun triathlon event.